At the Winter Meeting of the Friends of Ned Wolf Park held in January 2013, it was decided to move forward with the Terrace Wall Capital Campaign. We're working to raise funds to remove all the creosoted landscape ties that were installed when Ned Wolf Park was created in the 1970's. Now that those timbers are rotting and becoming more hazardous, we are seeking to replace them with durable stonework, including local Wissahickon schist and Pennsylvania bluestone. We've already amassed the funding to build Phase I, which would replace the steps with bluestone treads and schist risers. And we're working with the City of Philadelphia Parks and Recreation Department to get that done this year. But we need to raise funds for the terrace wall, which we've designed to include a functional bluestone cap which would act as continuous seating around the central terrace. 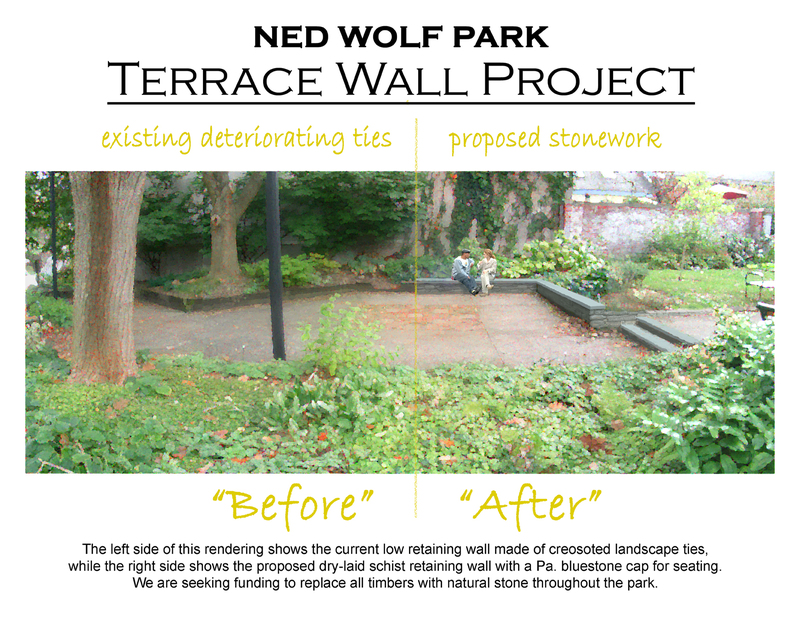 If you'd like to contribute to our Terrace Wall Capital Campaign, please contact Friends of Ned Wolf Park treasurer Janet Novak at janet@indri.org.